On the glamorous subject of millinery. There is so much to say today! Inspired by Sophie Wessex this morning ( sorry to jump on the bandwagon! )…but HOW FABULOUS!?! Here’s her link on the awesome online fashionistas daily journal,Marie Claire.co.uk. if you missed it. Jane Taylor certainly came up trumps! This stimulated me to say a huge congratulations to one of the milliners whom we showcase on-line at Suzannah.com and at the Suzannah boutique: Gina Foster. Gina’s Beroda Ivory pillbox graced the pages of Vogue this month. A stunning piece, which would actually be the perfect piece of crowning glory for any well-heeled member of society. Gina often dresses the Duchess of Cambridge. I think perhaps this could be her next? 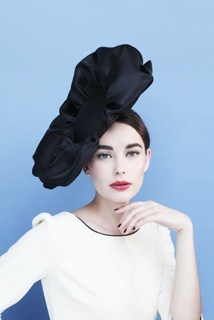 Showcasing three milliners: Emily Baxendale, Gina Foster and Edwina Ibbotsen, the Suzannah boutique holds host to the most fabulous array of millinery this season. Some pieces have been commissioned to work with the Suzannah vintage couture style and other pieces are signature styles of the season carefully chosen from the collections of the British milliners involved. I also have my eyes on Piers Atkinson, whom I came across at London Fashion Week last season. His be-dazzling pieces are just such fun! Millinery has almost become a necessity for a British wedding these days, with the cool factor for SS12 from being seen in the perfect pillbox, the chicest ‘saucer’ , a seventies resort hat or the most avant-garde show piece. There is certainly a style that suits each outfit and each person. If the event or outfit that one chooses does not quite require a hat this season, my feeling would be to opt for a gorgeous fifties inspired wide head-band or vintage hair combs instead of a fascinator . The photograph below is for the cream 1950’s inspired hairband. by Emily Baxendale . Perfectly Retro. With the new rules for the Royal Enclosure at Ascot being “a hat of 10cm diameter or more”, we feel it is time for the fascinator to take a backseat anyway and make way for some more substantial millinery, and indulge in what us British most clearly do best! Here is our boutique’s more”avantegarde” favourite from Gina Foster this season. The Premier.